It’s a special occasion dinner, a fabulous Sunday supper or just a delicious weeknight meal. Beef Tenderloin is always a favorite, and I often get requests for different ways to prepare it. Cooked correctly, this cut of beef can be so tender it will melt in your mouth. In fact, beef tenderloin is widely regarded as the tenderest of all cuts. (After all, you’re getting a filet as a bonus!) I’m sharing a recipe that requires only a few ingredients including a Dijon mustard and butter slather that keeps the tenderloin sealed for a succulent outcome. The spices are blended with delicious savory crushed potato chips, and the combination is all you need to bring out the best in this tenderloin! A refreshing, bright Mango Avocado Salsa is the perfect side for this meal. Watch my How to Video Here! Heat oven to 400 degrees. Crush potato chips with mini food prep or place chips in a zippered plastic bag and crush with rolling pin. In a bowl, combine spice blend with crushed potato chips, mixing well. (For the spice blend, I recommend: 1 tablespoon of McCormick Grill Mates, 1 tablespoon McCormick Roasted Garlic Powder, 1 teaspoon smoked paprika, 1 teaspoon salt, 1 teaspoon pepper and 1 teaspoon Italian seasoning blend. Or, you can use any of your favorite beef barbecue or rub spices). In another bowl, combine softened butter and Dijon mustard, whisking until smooth. 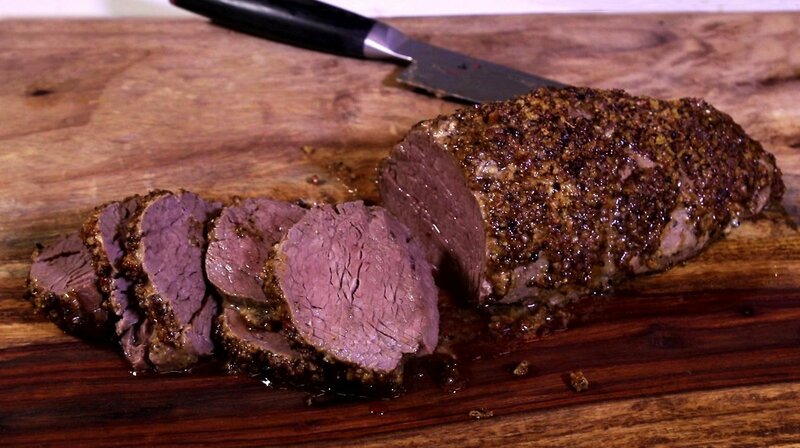 Place beef tenderloin on a baking sheet. With a pastry brush, completely coat the top and sides of the tenderloin. Sprinkle the crushed potato chip and beef spice combination over entire beef tenderloin, patting gently to adhere to mustard. Place in 400 degree oven for about 45 minutes or internal temperature is 130 degrees for rare, 140 degrees for medium rare, and 155 degrees for well done. (Jan’s Note: I cooked the tenderloin to 140 degrees.) Meanwhile, make mango avocado salsa and when done, refrigerate until ready to serve. When beef tenderloin is done, remove from oven and let rest for at least 10 minutes before slicing. When ready to serve, slice tenderloin in thin slices and plate with spoonfuls of Mango Avocado Salsa. In a medium bowl, combine diced avocado, diced mango, Serrano pepper, tomato, red onion, cilantro and the juice of one large lime. Gently stir to combine. Add a pinch of salt if needed. Refrigerate until ready to serve.